I try very hard to not make any mistakes, but occasionally I do. For your convenience, corrections will be posted here. If you find a mistake in any of my charts, please let me know so I can make the necessary corrections! If you would like to save the pdf files on your computer right click on the “View Pdf” links below and select “Save target as”. I made a big mistake in the Jessica diagram, starting on page 7 of the instructions. The graph on page 13 is correct, but if you would like to have the correct stitch diagram, please download! If your chart has Version 1.1 on the back page right under the title, you don’t need the correction. Good grief! I left the “G” out of the alphabet! Download the corrected alphabet page here. If your chart has Version 1.1 on the back page right under the title, you don’t need the correction. The main graphs are correct, but the stitch diagram is off by one thread at the top. The corrected diagram pages are in the “WinterFantacyLargeJessicaCorrection” pdf file which can be downloaded and printed. If you purchased your chart after January 2009, the chart should be correct, but if you have a question about it check here. 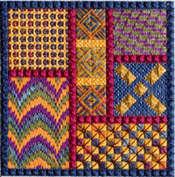 “While you’re in the mood to stitch pavilion diamonds with the silk floss, go ahead and stitch the pavilion diamonds that form the interior border of the double diamonds. There are 15 canvas threads between the bottom of the pavilion diamonds in the upper band and the top of the pavilion diamonds in the interior border. You may begin stitching the interior pavilion diamonds at any point, by counting 15 canvas down and beginning a pavilion diamond. It may make more sense, however, to start at the top point of the diamond shape, or at one of the outside edges. The outside edge is one canvas thread in from the outer edge of the previous stitches, on both the right and the left sides. After the interior pavilion diamonds borders are stitched, stitch pavilion diamonds band for the bottom edge. It mirrors the top band. The bottom of the pavilion diamonds interior border is 15 canvas threads from the top of these pavilion diamonds, the same distance that the top band is from the interior pavilion diamonds border. In the first printings of Happy Hour, I was a complete doofus, forgot how to count and said it was 14 canvas threads. That is absolutely wrong, since the crescents cover 15 canvas threads! Dorothy caught it, emailed me, and the book is now corrected. But if you got one of the first printings, yours may say 14 canvas threads. I am so sorry, and apologize in advance for the frogging! The floss color is shown as “45050 Very Dark Lavender” on some charts, and should be “45040 Very Dark Lavender”. It has been corrected on subsequent printings of the chart, and is correctly listed on the thread table inside the chart. On the back cover, Tranquility 217 is listed as one of the required threads, but I didn’t use it in the design. This is only on the first printings of the chart; we got it fixed for later printings. Tranquility 217 is not needed for the design. I don’t know how I managed this one, but I forgot to list one of the threads needed for the design, on the back page AND on the first inside page. You will need 1 skein of DMC Satin Floss S741 Medium Tangerine. I have managed to get it corrected for later printings, but if you got one of the first printings you won’t know about this thread until you get to page 27. Trying to stitch “THE BIBLE”. I am pretty much colorblind and am lost without Color Key. Hi Deborah, If you’ll email me I’ll send you a color key. I chose not to include one so I could make the chart as large as possible. Adding a color key to the page would have reduced the overall size of the chart. But I’ll be happy to send you a color key if you’ll email me. I believe I found an “oops” in your Diamond Delight V. On page 23, for the second portion of the teardrop crescent with tail, there are 5 stitches on the top. The down portion of stitch 1 and then the start of stitches 8, 9, 10, & 11. However in the large chart there are only 4 stitches. I discovered this when I was making sure my stitch placement lined up with the chart. I would like the chart of the canvas shown on the right of the page. Maybe it’s me, but how do I get it? It’s very pretty. Hope I’m entering this in the right place. I’m working on Citrine and am nearly done. I just realized that thread SL11 is listed in supplies but not indicated on any of the pattern instructions that I can find. Was there a change somewhere along the way? When I first published Citrine I was rushing to meet a trade show deadline, and put in SL11 in the materials list. I later discovered that I hadn’t used it in the project, and removed it from the subsequent materials list on reprinting. I’m so sorry, you must have gotten one of the first ones with SL11 listed. So yes, there was a change along the way and I didn’t catch it before printing. Thanks!